Vivaldi in action on Windows. There's a new browser aiming to win the hearts and minds of power users. Called Vivaldi, the Chromium-based browser comes from a team led by Jon von Tetzchner, co-founder and former CEO of Opera Software. Vivaldi is available now as a technical preview for Windows, Mac, and Linux. The overall look of Vivaldi is a mix of a classic browser UI and the more sparse, modern interpretations in browsers like Chrome and Microsoft's upcoming Spartan. In the upper left corner, you have a small menu button; below that the address bar with home, back, forward and refresh buttons to its left. There is also a left sidebar for quick access to browser features such as bookmarks, contacts, downloads, and notes. At the very bottom of the sidebar is a settings icon for quick access to your browser's preferences. There is also a search box to the right of the address bar that is set to Google by default and doesn't appear to be changeable at the moment. Vivaldi appears to be an attempt by Tetzchner and his team to remake what they believe Opera should've been. 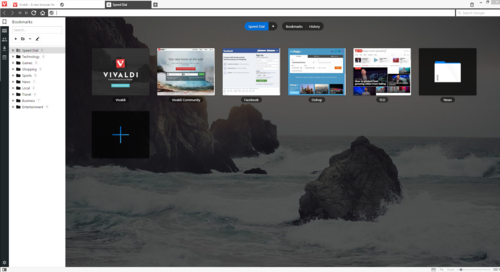 Before it became a browser, Vivaldi was an online community for dispossessed Opera users after Opera Software shut down its community site in late 2013. Vivaldi, the browser, also contains many Opera-like traits including Speed Dial, a built-in mail client (still under development), and built-in note taking. As this is a technical preview, don't expect Vivaldi to be a blazing fast browser. In my tests on Windows 8.1, Vivaldi felt sluggish and less responsive than other browsers. That will likely improve over time. Other than a note-taking app and upcoming mail client, Vivaldi also has some nice features to appeal to power users. There's a keyboard-centric feature called Quick Commands that is summoned with ctrl+Q. The feature summons a pop-up window that offers quick access to open tabs and browser commands. Type in the name of the setting or tab you're looking for and Quick Commands filters your results to help you quickly find what you need. You can also group tabs into folders on the Speed Dial page, or group tabs together by dragging them on top of each other. Vivaldi also makes it easy to figure out where you are with a large number of tabs open. The active tab takes on the main color of the favicon of the site you're visiting. Check out PCWorld and the tab turns red, on Google blue, and The New York Times, black. Inactive tabs remain white, and when another app is in focus all tabs turn monochrome with the most recently active tab darker than the rest. Overall, Vivaldi is a nice looking browser in its technical preview form. It's still lacking some features that are expected in future versions, such as extensions and the expected mail client. But if you enjoy playing around with new browsers, there's a lot to like with Vivaldi even in this unfinished state.